Perfect bound book, 11 x 8 1/2 large format. 72 pages with 40 - 5x7 full color photographs. Printed in Maine on recycled, acid free Chorus Art gloss text. for 3 to 6 books please add 4.95 s&h. If you would like priority or overnight mail please email me for shipping rates. For wholesale, bookstore or library orders please email LoonsofTacoma@aol.com for our prices and payment terms. "You have created a very special volume. It is much more than a book of beautiful photographs of loons." "The completeness of the description of the life of the loons makes this a superior volume, very unique." "This volume is both a scientifically sound and extremely interesting text describing the life of one of Maine's most cherished summer visitors." "Your week by week journaling of this aspect of nature is fantastic, educational and profound. I welcome this gem to my classroom library." This book was created through the grace of God and a very special pair of Maine loons, who allowed me to photograph them along with their newly hatched young. 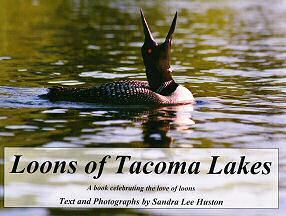 The photographs in this book were captured at the Tacoma Lakes region in Litchfield, Maine during the summer of 2005. This area consists of four connecting ponds named Woodbury, Sand, Buker and Jimmy totaling an area of about five miles long. The bulk of the loon photographs captured were on Woodbury and Sand, the largest of the four ponds. Our first Sunday morning kayaking begins on the tenth of July, with my friend Jan Mulherin and I enjoying the peacefulness and tranquility of the early morning hours. After the wonderful loon sightings we had viewed that morning, both of us decided to meet each Sunday morning at the same time to see if we could continue to capture more photographs of the breeding pair with their young. By the end of the summer, I had taken a total of sixteen rolls of film, mostly of this one remarkable pair of breeding loons with their chicks. The idea of a loon book began to unfold after viewing all these beautiful up-close and personal photographs. The biggest challenge I faced throughout the winter months, while researching and writing this book, was compiling informative text to complement each of the photographs I had captured without becoming technical. To help the reader follow along throughout this pictorial book, I have cataloged each photograph with the number on the roll of film and the week it was captured. You will find this number below each photograph in front of the title. This way you, the reader, will be able to determine what week we are at throughout the book and the age of the loon chicks as they mature. At the beginning of the book you will find some general background information on common loons, and as the story unfolds, I have added additional information in relation to each new photograph displayed. 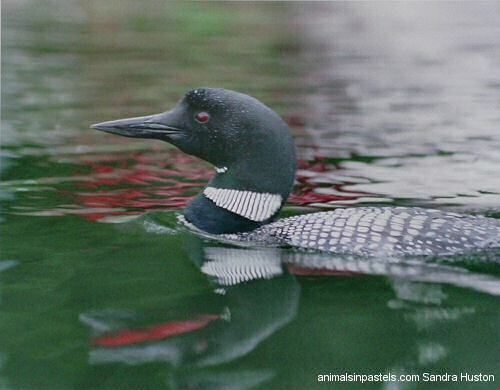 For an added bonus you can visit this website: http://www.sbaa.ca/projects.asp?cn=303 (The Science Behind Algonquin's Animals), scroll down the page and click on the "loon sounds," and listen to the different calls of the loons while reading my book. This way, with the calls of the loons in the background, it will almost seem as if you are right on the lake kayaking beside me. I hope you enjoy your journey following along with me as I bring you a little closer to one of the most beloved birds of North America, the "Common Loon." 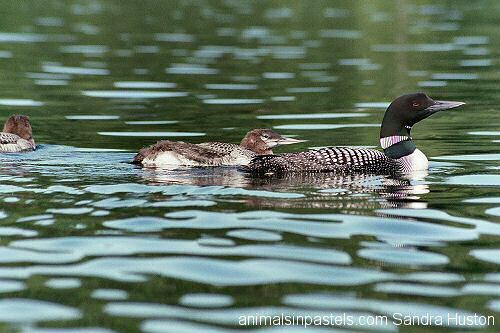 Loons of Tacoma Lakes, documents a pair of Maine common loons raising their newly hatched chicks, beginning when the chicks are about three weeks old and ending when they are fully fledged and just starting to fly. 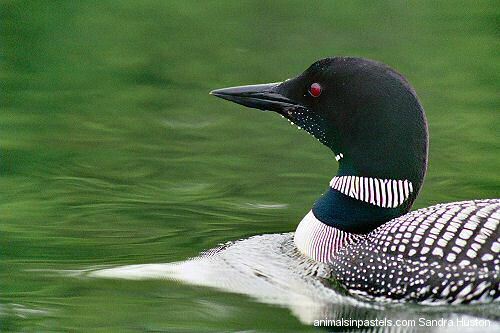 From July to October 2005, the author kayaked the connecting ponds of the Tacoma Lakes region in Litchifeld, Maine, gaining the loons' trust while documenting weekly changes as the young loons matured. Throughout this 72-page book you will find 40 full color 5x7 photographs including stunning up close and personal shots of the breeding pair and other loons visiting the area. Also included is background information on common loons, loon conservation and tips on how you can help loons flourish in your area. The author also talks about the photographic equipment she used along with her digital darkroom process. This unique loon book both educates and delights you with its rare photography.